Yesterday, I wrote about the advantages of buying fewer toys, but focusing on higher-quality toys. This makes sure that you’re not replacing toys because they’re cheap, you’re not filling your house up with clutter, and the toys have resale value when you’re finished. If you’ve spent time around children, you’ll quickly notice a few key things about how they play. First, they play imaginatively. They’re constantly making up adventures and games. They’re constantly drawing pictures and creating art. The only time I’ve found when my children don’t do this is when they’re watching a television program or sleeping. If that’s how they play, then doesn’t it make sense to purchase toys that actually support that kind of play? An ideal toy for a child is one that can be used in a wide variety of situations for a wide variety of purposes. There’s no set beginning, middle, and end of playing with such a toy, and because of that, open-ended items tend to get played with a lot, meaning that your children need fewer toys to play with. The toy above is a great example of both the good and the bad of what I’m talking about here. On the one hand, it allows the person playing with it to create free-form art. You can essentially draw anything with this set, and you can constantly create new pictures with it. That’s a very good thing, as there’s no set way to play with it. On the other hand, it’s limited in that you can only really draw on this one screen and you have to use special supplies to draw on it. What I look for in a toy are two things. One, can it be used in a wide variety of situations? 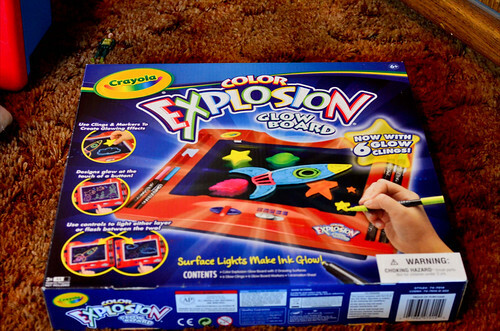 A box of crayons is more open-ended than this, for example, because you can color on a wide variety of papers and surfaces, plus replacing normal crayons is much less expensive. Second, does the item offer a wide variety of possibilities for play? For example, look at two dollhouses. One has the furniture and floors all fixed tightly in place so that they cannot be moved. Another dollhouse enables you to move the floors and walls and furniture to your heart’s content. Both can be played with as houses for dolls, but one can also be used as an interior design toy. The second offers much wider opportunities for play. Why is this so important? Again, an open-ended toy is much more likely to attract lots of play as compared to a less open-ended toy. If your child plays with a small number of toys a lot instead of the reverse, that means you’re spending far less money on toys. Open-ended toys also tend to grow with the child, having a much longer lifetime of play than other toys. My son goes through phases of who his favorite comic book hero is every few months, but he and his sister still draw all the time, just as they did three years ago. So, fill your house with blocks, Legos, building materials, dramatic play clothes, and art supplies, and perhaps build a sandbox in the back yard. The relative cost of these things is really low, while the replay value is incredibly high.